I've been checking everyday and so glad to finally see that for sure Amelia Rose is alright and with her mommy and daddy at home!! You don't know how much I needed this!!!! Please don't feel any pressure to post. Take the time you need to take care of Amelia and yourself and I have no doubt you are!! You are very, very lucky. oh sweetheart! i think this is the best news i have heard... well ever!! what a beautiful baby.. love all that hair.. I'm sorry Emma and Logan aren't there to share in the joy. Welcome home, Amelia Rose! Welcome to the world, Amellia. She is gorgeous. Congratulations. She is gorgeous! Welcome Amellia! I have been checking all weekend for this....I am so happy for all of you! Welcome to the world, beautiful Amellia! Congrats to you and your family and having your prayers answered. She is so sweet! I am so happy for you and your family. Your faith that God has a wonderful plan for your life has brought you a beautiful baby girl. She is beautiful. I'm sure it feels like a fairytail when you take her in her beautiful bedroom and rock her. You deserve it, your faith brought you here. I know your mom is relieved and delighted in this time. I remember holding my breath until my rainbow granddaughter arrived. 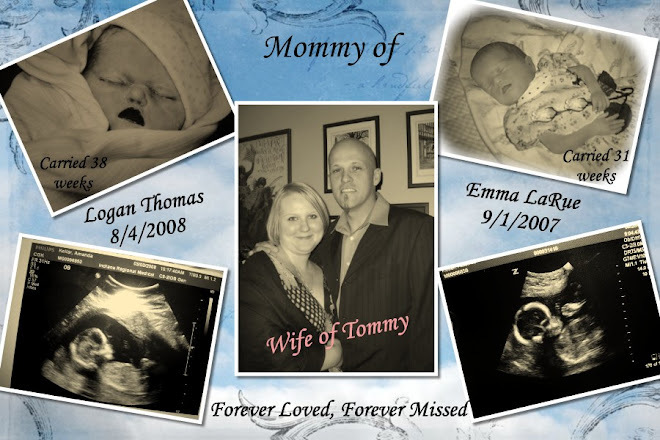 I look forward to following your blogging as you and Tommy continue to fall madly in love with this precious gift. Again, I am so happy for you. The prayers will continue for you and your family. You will experience multiple emotions along the way. But, remember Emma and Logan are in the presence of our Holy Father and they want you to be happy. They are smilling down on you today. So very happy for you - Amellia Rose is a beautiful girl! Congrats, I have been lurking waiting to hear that you guys came home. She's beautiful, and wow what a head of hair. I have been anxious, just waiting for this post. I am so very happy for you and hubby (his big grin says it all), it is long awaited, and my heart soars with joy for you. I can see Emma and Logan looking down at you all and smiling. My sister said to me once, "what better guardian angel to have, but your own brother and sister?". Sending you all love and warm thoughts. She is so pretty. Congratulations! Congratulations, Amanda! I saw a comment you had made on Jen's facebook- so I knew Amelia had arrived safely. So good to hear the story of her arrival and see her beautiful pictures. Good job Mama! Congrats to you all! SHe is gorgeous. You are gorgeous. What a beaming Dad! Thank you for the update and pictures. You've travelled a long and windy road and you so deserve this. I wish you all the happiness in the world. I'm over the moon for you! Congratulations Amanda. I'm so relieved that everything went well. Amellia is beautiful. And look at that head of hair! and how come you look so great after labor????? Huh? Glad you are enjoying little Amellia, I am sure your heart is bursting with love right now. Much love to you and your family. Congratulations! I'm so happy and feel very lucky to share in your joy. Welcome to this world sweet baby girl! Congratulations - she is a beauty. She's so so beautiful. I have been looking at all your photos of her on Facebook and I am so happy for you guys! Congrats, she's amazing!! What a beautiful little girl! Congratulations! I hope you're all happily adjusting to life together. The popular comment layout is common, so it is easily recognized scanning to post a comment. If the comment section is in a different format, then I am going to spend more time trying to decipher what everything means. I was browsing blogger when I stumbled upon this and let me just say I'm so touched by your blog. The music, the words, the pictures... you've brought tears to my eyes. Congratulations, I know you're going to be a great mother! <3 Amellia Rose is such a beautiful name. God bless you and your family forever. I was blog hopping when I came across your blog. Very touching, I am father of three and your blog really moved me big time. How is Amellia Rose doing? Hope you would post an up date of what she looks like now. I was also blog hopping... what a touching story... thanks for sharing your painful memories... I wish you and your family all the best! I was blog hopping as well...Thank you for your thoughts and your strength. People that have made it through this kind of sorrow have the deepest love and make all the difference in this world! Thank you and God Bless you and your family.